Wool and Wheel: My favorite film soundtracks. I used to listen to soundtracks all the time. When I was in school, I listened to instrumental ones constantly while I did schoolwork or homework. I listened to classic movie soundtracks while taking a bath (I can't believe I just admitted that, but yeah...I'm one of those people who listens to music in the tub). I listened to Disney soundtracks in the car. No shame! I don't listen to them quite as much as I used to, but﻿ I still appreciate a good movie soundtrack! I love how a story and music can intertwine in my mind, and how hearing a certain song can remind me of an exact moment in a film. It's sort of like being able to watch a film while doing other things. :) Here are some of my favorites! Jane Eyre. Some more of the genius of Dario Marianelli. I don't love this film adaptation of Jane Eyre as much as I did when I first saw it (the mini-series is so much better), but this is one of the most hauntingly beautiful soundtracks I've ever heard. It gives me chills. Titanic. I've probably been listening to this soundtrack longer than any of the others on the list. I used to be obsessed with this film (and as I recently mentioned, it's responsible for my lifelong crush on Leonardo DiCaprio). But even if you're not a fan of the blockbuster movie, or the Celine Dion theme song (honestly, I like the theme, but not the vocals version), you have to admit that this is some amazing, heartbreaking music. North and South. Technically this soundtrack was never released, which is ridiculous because it's so good. But if you look online, you can usually find it...that's all I'll say about that. The Lion, the Witch, and the Wardrobe, and Prince Caspian. I'm a huge Narnia fan, and I do enjoy the movies (though, in the case of the second and third ones, they could have been so much better). The music from them is really pretty, too. And I adore the Switchfoot song on the Prince Caspian soundtrack. The Artist. The soundtrack for this movie is so fun and quirky (just like the film itself), and I love how 1920s-ish it is at times. Singin' in the Rain. I used to listen to this one so often that I had practically every note memorized. :) It's from my favorite classic movie (and musical), so of course I love it to pieces. 'S Wonderful: Gene Kelly at MGM. This is sort of a "best of" CD. And if you're not obsessed with Gene Kelly, it probably won't impress you. But I happen to love Gene Kelly's dancing and his singing. This album has some of the more popular songs he sang in his MGM musicals. Somewhere Over the Rainbow: The Golden Age of Hollywood Musicals. I don't even know if this two disc CD is still available or not...I bought it on Amazon years ago. It has tons of random songs from musicals, some very famous (Over the Rainbow, Singin' in the Rain), others somewhat obscure. Along with the That's Entertainment! films, this gave me a great start on a list of films to check out when I first started getting into musicals. The Hunger Games: Songs from District 12 and Beyond. This isn't technically a soundtrack, though some of the songs do play during the credits of the film. I was interested in this one because 1) it featured the Civil Wars and the Secret Sisters, two artists who I love, and 2) I had heard that a lot of it was sort of bluegrass-sounding. But I never expected to love this CD as much as I do! They did such an amazing job of choosing songs that fit with the spirit and atmosphere of the film perfectly. But while the songs definitely have a Hunger Games vibe, they're so good that I can listen to them anytime, not just when I'm in a soundtrack mood. You've Got Mail. Again, this shouldn't be a surprise since this is another of my favorite movies. It's just a really good mix of music, with a bit of an oldies influence (Bobby Darin, Louis Armstrong, etc.). 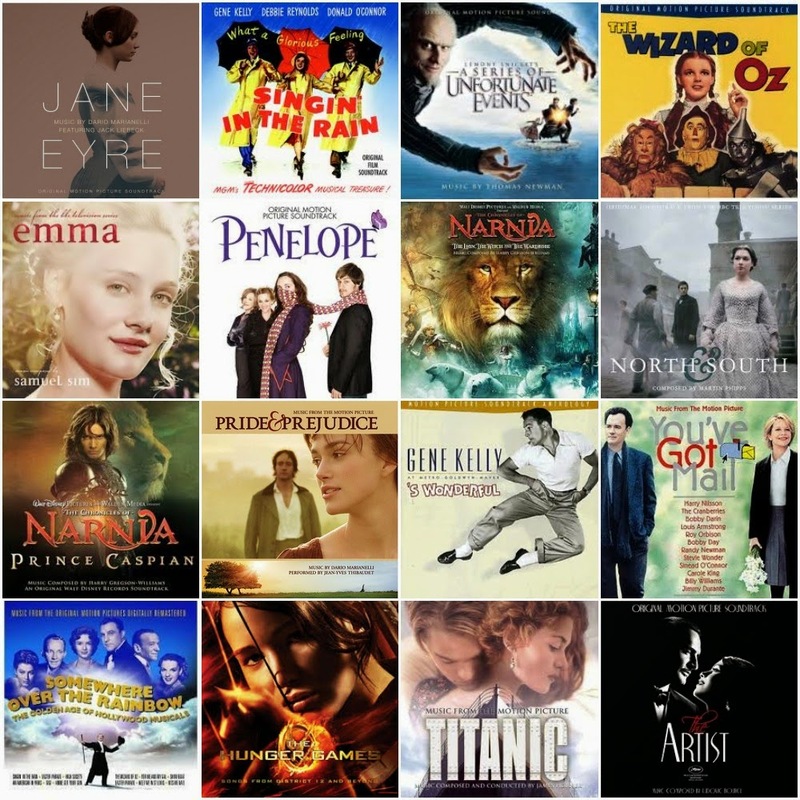 And a couple of other random soundtracks that get honorable mentions, because I love some of the songs from them but they're not absolute favorites: The Sound of Music, Seven Brides for Seven Brothers, Alice in Wonderland (Tim Burton film), and Fantastic Mr. Fox. Awesome! I like a lot of those too. Some of my all-time favorites are the Lord of the Rings soundtracks, plus Rachael Portman's soundtracks for Emma and Nicholas Nickleby. 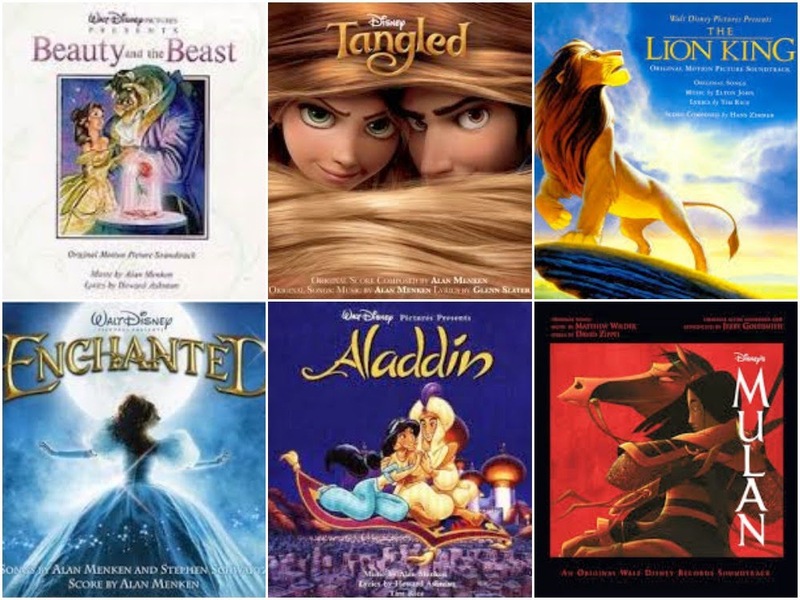 And as for Disney soundtracks...my favorites at the moment are Frozen, The Little Mermaid, and Beauty and the Beast. The Little Mermaid! I forgot about that one. :) I do love that movie...it was one of my favorites as a child. If you love the P&P soundtrack, you'll probably love the Jane Eyre one. It would probably fit best if you're reading something sad or dramatic, though, because the music is kind of like that. :) They're by the same composer, but while P&P is more piano based, Jane Eyre is the violin (I think?). The Narnia ones are really good, aren't they? Lots of good picks! I like soundtracks too, although I only like listening to them when I'm in the right mood. I tend to listen to Broadway albums more, which is kinda similar. I LOVE the Emma soundtrack. It's so beautiful! The DW soundtracks are probably my favorites and most listened to. Hello, Dolly! is my favorite movie musical soundtrack. Usually I like the Broadway versions better, but I can't stand the original Broadway cast of Hello, Dolly!. And you can't go wrong with Disney! Aladdin is my all time favorite Disney soundtrack, no question about it. I haven't listened to the whole soundtrack, but I love Flight to Neverland from Hook. John Williams is awesome and such a classic! Aladdin is a really good soundtrack! I was going to just buy downloads of Friend Like Me and Prince Ali, but to get those you had to buy the entire soundtrack. I'm glad I did, though, because I really enjoy all of it now! oooh, you've got some good ones...and some I've never heard (Jane Eyre, A Series of Unfortunate Events, Penelope) that I need to check out. The songs from Mulan are so awesome. I frequently have the song "I'll Make a Man Out of You" stuck in my head, which is a little embarrassing ("Let's get down to business to defeat the Huns...Did they send me daughters when I asked for sons?"). And Tarzan! I knew I was forgetting something important! I loved the songs from that one. (And that's the only reason I even know who Phil Collins is, ha.) Tarzan is such an underrated Disney movie, I think. I have so many favorites, but I think my #1 fave is the soundtrack to "The Ghost and Mrs. Muir." The music in that movie is beautiful and so haunting. It's a character in itself. My favorites are Gone With The Wind and The Last of The Mohicans. No lyrics, just orchestral and very beautiful. And though it's not my favorite, I couldn't pass up purchasing Dirty Dancing on vinyl at a flea market over the weekend :D I also like to blare The Little Mermaid lol I adore the song Part Of Your World! I remember sitting in the theater for LWW and being on the verge of tears for the entire movie...it was just amazing to see a story I loved so much on the screen! :) It was a very good adaptation.